Q1: What is Stuffed Animal Storage Bean Bag? A: The stuffed animal bean bag is a good helper! It helps moms keep the room clean and tidy. Q2: What does it work? A1: Put stuffed animal toy in the bean bag with your kids and fill it up, your kids will get a new toy! A2: You can also put extra blankets, clothes, and towels in, and any soft things can be put in. Help you save space and resources. Q3: What can the bean bag chair bring to kids? A: CALA LIFE storage bean bag is a new motivation for kids to storage their stuffed animal toys.As the same time, it teaches kids about the importance of responsibility,organization and Creativity in a happy time. Q4: What can the bean bag chair bring to Parents? A: Our item(CALA LIFE stuffed animal bean bag) make more time between parents and kids. It enrich families lives through imaginative, creative play to created more wonderful memorize. Q5: Why CALA LIFE stuffed animal bean bag is the BEST choice? A1:There are 7 patterns avaliable, and it blend beautifully with any bedroom decor. 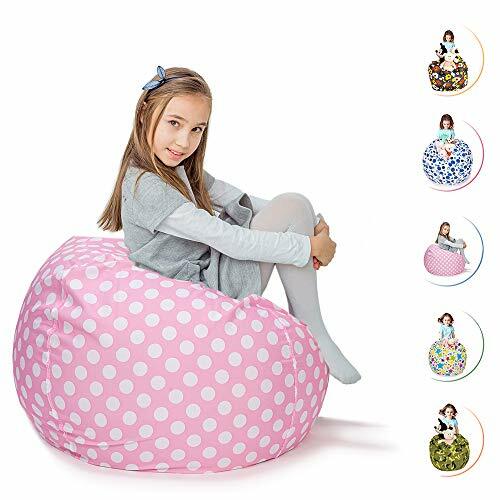 A2: CALA LIFE stuffed animal storage bean bags chair are made of premium cotton canvas that is soft and durable. Machine wash.
We're sure you will love our stuffed animal storage bean bag. If you are not happy with your purchase you can return your purchase within 30 days. If you have any problem with our product/service, please contact us. We are always willing to serve you. 1.INTERESTING KID'S TOYS, INNOVATIVE STORAGE BAGS - The bean bag can storage stuffed animals toys, and become new toys for kids! If you don't have enough stuffed animals toys, you can also storage household items such as towels, blankets and clothes. 3.BOTH MOM AND KIDS LOVE - Mom's helper, child's guide. The fun storage bag is also a extra motivation for the kids to keep their room tidy. 4.MAKE TIME TOGETHER - The bean bag can create a wonderful memorize. Children can sit on top of reading books or watch TV, and you can accompany your child in your leisure time. 5.100% SATISFACTION GUARANTEE - We hope that you have a pleasant purchase experience here, if you have any product/service issues, please contact us, we will provide you with solutions. If you have any questions about this product by CALA LIFE, contact us by completing and submitting the form below. If you are looking for a specif part number, please include it with your message.